Take Your Game to the Highest Stage with the Pokemon TCG: Evolved Battle Action Tin! Reach for the top in every battle! Each tin contains 1 of 3 powerful Pokemon - the grass Pokemon Serperior, the fire Pokemon Emboar, or the water Pokemon Samurott - as a special foil card, but that's not all - you also get that Pokemon as a collectible figure! Plus, each tin contains 5 Pokemon TCG boosters packs AND a BONUS code card for the Pokemon TCG Online that unlocks an online "foil" version of the tin's special card. With the Evolved Battle Action Tin, you can battle your way to exciting action every time you play! 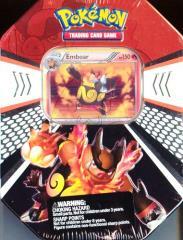 Emboar as both a foil TCG card AND a fantastic figure! 3 Pokemon TCG: Black & White Series expansion booster packs plus 2 additional booster packs! A BONUS online code card for the Pokemon TCG Online! Code cards in this tin unlock 5 booster packs total PLUS an online "foil" version of this tin's foil card!